The Magical Movers segment is all about doll-powered play! Kids can charge the doll and use her energy to activate exciting movements! Belle twirls the night away in the Dance 'n Twirl Ballroom. 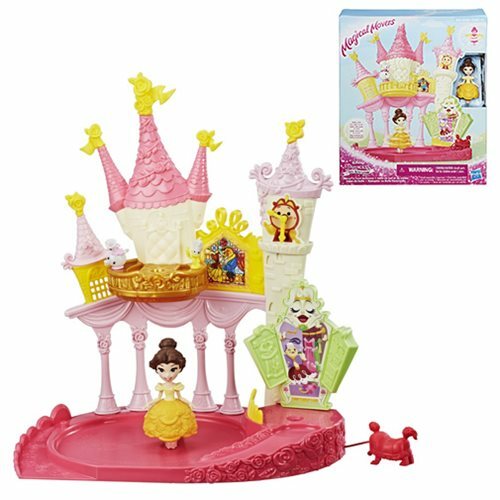 Charge Belle on the ballroom base, then put her on the ramp to see her twirl down the runway and gracefully spin around the dance floor. When you charge her, Cogsworth's hands tick! Place the charged doll on the balcony to see her friends, Mrs. Potts and Lumiere, spin along with her. Collect additional Magical Movers playsets (each sold separately) for even more doll-powered fun. Includes doll and playset. Ages 4 and up.